and her black attendant, Death. The following pages under DIET are for information only. Before starting on any diet, weight loss or otherwise, and fitness or exercise programs, it is always advisable to seek appropriate professional advice. Is Weight Loss Dieting any different from a normal diet? Basically no, everybody needs a healthy well-balanced diet to maintain good health. 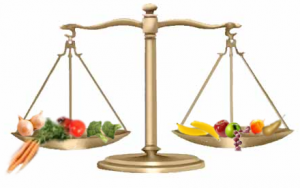 So, what constitutes a healthy well-balanced diet? There are a number of factors, but protein, carbohydrates and fat in their correct proportions, along with essential vitamins and minerals, are the basis of any healthy well-balanced diet. We will be discussing these in following articles on DIET – Weight Loss Dieting. What is the difference between weight loss diets and a normal one? Put quite simply, calories and portions. Unfortunately, the majority of people will always have a problem with weight gain and this can only be controlled by consuming the correct number of calories your body needs daily, known as your calorie maintainance level. More about this in later pages of DIET – Weight Loss Dieting. As an example, if you need, say, 3,000 calories daily and you consume 3,500 your body will store the extra 500 as fat and, at the end of the week, you will have gained one pound. 500 x 7 = 3,500, the number of calories in one pound of fat. Obviously, carrying on consuming calories in excess of what your body needs daily will, eventually, lead to obesity and all its health-related problems. Financial or marital problems, job insecurity and stress, are just a few of the things that can lead to what is known as “comfort eating”. Underlying psychological problems, something that keeps nagging at the back of your mind but you can’t quite put your finger on. Apart from gluttony, which only you can remedy, any problems you may have can be helped by consulting qualified counselors. Psychological problems will need medical advice. Let’s assume that any problems you may have had have been eradicated and you are now ready to start Weight Loss Dieting. Where do you start? Obviously, smaller portions. Take a tip from a humorous Oscar Wilde quote: “My doctor told me that to lose weight I should stop having intimate dinners for four unless there are three other people present”. Ask yourself “Do I really need that second helping or extra portion?” If you are honest with yourself the answer will most probably be no! Not only will your body tell you, by a feeling of hunger, that you need to eat, it will also tell you, by a feeling of hunger disappearing, that it is satisfied. Listen to what your body is telling you, don’t carry on eating for eating sake until you feel bloated. You are under no obligation to clean your plate, leave what you don’t need on your plate, it’s better there than in your stomach! Overeating, like smoking, is a bad habit and, like smoking, giving up will not only improve your health but also give you a sense of achievement and self-satisfaction. The first thing you need to do is check your fridge, freezer or larder. Are they full of processed foods, ready meals and junk food? They need to be replaced with more healthy foods. Unless you can afford to, I wouldn’t advise dumping them immediately. As you use them replace them with more healthy varieties, until you are in a position to start on your healthy weight loss diet. 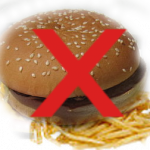 Make no mistake, there is no place in any healthy diet, be it weight loss or otherwise, for regular consumption of such foods as burgers, processed foods, many baked foods, fizzy and sugary drinks, etc, they may be ok as a treat occasionally, they are high in calories, low in nutrition and loaded with trans fats. Did you know that a 215 gram Big Mac contains a whopping 550 calories and 29 grams of fat? It also contains 75 mg of cholesterol and 970 mg of sodium. A 258 gram Big Mac Cheeseburger is even worse having 704 calories and almost 44 grams of fat, 142 mg of cholesterol and 1148 mg of sodium. Throw in a medium (117g) portion of French fries and you can add another 330 calories, 19 grams of fat and 270 grams of sodium to the above totals. Food for thought (no pun Intended). What about fizzy and sugary drinks? Another non-starter in any weight loss program. A standard 330ml can of cola contains 10-12 teaspoons of sugar and around 150 calories. “Ok, I’ll change to diet cola.” Don’t be fooled. Although sugar free and containing only around one-and-a-half calories, it is unlikely to help in your weight loss ambitions. It is sweetened mainly with aspartame, one of the most acidic sweeteners you can find, and excessive consumption can actually cause weight gain! Why? Read on. Your body is slightly alkaline being 7.3 to 7.5 on the pH (potential of hydrogen) scale of 1 to 14, 7.0 being neutral. A cola is 2.0 on the scale which is extremely acidic. Briefly, excessive amounts of highly acidic food and drink consumed over lengthy periods will, eventually, lead to your body no longer being able to maintain the optimum pH of 7.3 to 7.5 that is done naturally through the pancreas. When the pancreas can no longer do this naturally your body develops fat to absorb the excess acid, resulting in weight gain. If you would like more in-depth information on pH, See Posts: pH (potential of Hydrogen) – Part 1 and pH (potential of Hydrogen) – Part 2 which may help your understand the importance of pH to your body when Weight Loss Dieting. Regardless of what the prophets of doom and gloom say, dieting for weight loss can be enjoyable. It doesn’t have to be a chore or become unpleasant. Treat yourself occasionally to whatever you enjoy. Maybe that chocolate bar (dark chocolate preferably) or that extra glass of wine (red preferably), both can be beneficial to your health as long as you don’t overdo them. Resolve to cut out all fast and junk food, and some foods that may not be conducive to healthy weight loss. You will still be able to eat many of the foods you now enjoy so long as you stay within you daily calorie allowance. Who knows, you may even discover foods that you have never tried before, but now are able to enjoy them. Just one word of warning! There are many low-calorie foods that are known as empty calories (refined granulated sugar is one of them) because, although low in calories, they contain little or no nutrients, vitamins or minerals. Having no place in a healthy well-balanced diet, steer clear of them. Weight loss dieting: How Much How Often? It is a well-documented fact that breakfast is the main meal of the day. After you have fasted for maybe eight hours during sleep, it provides the energy to start the day. In this first article on Weight Loss Dieting, skipping breakfast is not recommended, as it can lead to a feeling of hunger and unhealthy snacking before your next meal. As long as they are kept at a reasonable level, don’t be too concerned about the amount of calories in your breakfast, it is more important that you have one. The calories can always be adjusted in your remaining meals. Now the question of how much? As stated previously, smaller portions are all important. It’s not really difficult. Use plates half the size of what you normally use, it will halve the size of what you would get on your normal plate. Another popular or recommended way to reduce the amount you eat is drink water, water supposedly being an appetite depressant, although this is disputed by some doctors and dieticians. Try it for yourself. Eat what you would normally eat and for your next meal eat exactly the same amount of ingredients, but drink a glass of water before starting your meal and one while eating your meal. If you consume less food while eating the second meal it obviously works for you. There are no hard and fast rules on how often. There are those who recommend eating three main meals and, providing they are healthy and you keep within your daily calorie allowance, snacking between meals will help keep up your energy levels. Others advocate five or six smaller meals spaced evenly throughout the day, is the way to go. This, they say, will keep up your energy levels without the need for snacking, which can sometimes lead to the temptation of snacking on unhealthy foods such as chocolate bars. They may have a point, and it may be convenient for some, but what if you work in an office or factory, can you keep stopping every couple of hours to eat your meal? At the end of the day it’s all about healthy eating and staying within your daily calorie allowance. Find out what suits you best and stick with it. I hope, after reading DIET – Weight Loss Dieting, you will go on to read the rest of the articles on DIET – Weight Loss Dieting, as they can play a major part in your effort to lose weight. The next article on DIET – Weight Loss Dieting: Protein, can be viewed by clicking on the link below or through the drop down menu if preferred.